1. Which among these two teams will be the winner of FIFA World Cup 2018? 2. Which team will score the first goal? 3. How many goals will the winning team lead with? 7th Prizes Lucky Winners Win Free 50 Walkaroo Backpacks worth Rs.499 Each. Only Indian Nationals residing in India shall be eligible to participate in this contest. Only participants who have liked the Official Facebook page will be considered for selection of the final winner. One person shall submit only one entry per contest. In case more than one person submits the right answer, the final winner will be selected by a draw of lots. Prizes will be - Gold coins worth Rs. 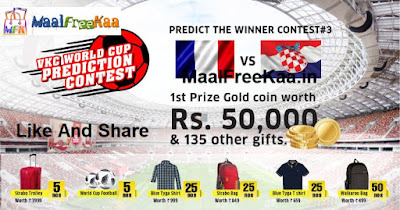 50,000 (One person), 5 Strabo Trolleys worth Rs.3999 each, 5 World Cup Footballs, 25 Blue Tyga Shirts worth Rs.999, 25 Strabo Backpacks worth Rs.849, 25 Blue Tyga T Shirts worth Rs.659, 50 Walkaroo Backpacks worth Rs.499. The prizes are non-exchangeable, non-transferable, and is not redeemable for cash or other prizes. WorldCup Prediction contest 3 ends at 8.30 PM IST on 15th July, 2018. All the winners will be declared on or before 20th July, 2018. The contest is organized by U4iC International Pvt Ltd (U4iC), Coimbatore. This contest is subject to all prevailing tax laws. Any tax liability in connection with the prizes under this contest shall remain with the individual and cannot be claimed from U4iC. U4iC reserves the right at any time and from time to time to modify or discontinue, temporarily or permanently, this Prize Draw with or without prior notice due to reasons outside its control (including, without limitation, in the case of anticipated, suspected or actual fraud). The decision of U4iC in all matters under its control is final and binding and no correspondence will be entered into. All disputes are subject to Calicut, Kerala jurisdiction. This contest is in no way sponsored or administered by Facebook. Link Generate by our Team member referral link Because our Term Who's share with us best contest we promote free. The information you provide will only be used for this contest’s purposes.